Councils across Greater Christchurch are working together to review the planning framework to ensure there is the appropriate provision for the growth of the City and surrounding towns over the next thirty years. The project will culminate, towards the end of 2018, in an updated settlement pattern component to the existing Greater Christchurch Urban Development Strategy (UDS). The Greater Chirstchurch Partnership is now seeking feedback via a 2 minute online survey. To access the survey please click here. The Greater Christchurch Partnership (formally the Urban Development Strategy Partnership), which includes Christchurch City Council, Selwyn District Council, Waimakariri District Council, Environment Canterbury and other key public sector agencies is overseeing a settlement pattern review, a project known as Our SPACE. A collaborative approach is needed, given that the urban areas and the transport networks across Greater Christchurch function as one interconnected system. Our SPACE will also incorporate the requirements of councils outlined in a new National Policy Statement on Urban Development Capacity. Our SPACE will look at what is already outlined in key planning documents, such as the Regional Policy Statement and District Plans, in order to update knowledge of the anticipated housing, commercial and industrial needs for the next thirty years. This evidence base will inform what more needs to be done to provide for land uses through to 2048 and will inform a public consultation phase during 2018, as outlined in the diagram above. The Our SPACE project will also link to and integrate with the District Plan review processes planned for Selwyn and Waimakariri districts. Our SPACE is a crucial next step towards achieving the Partnership’s vision. This vision emerged from the extensive community engagement that helped shape the UDS ten years ago. It was reconfirmed by the Partnership as part of a UDS Update document prepared in 2016 and has been reinforced through feedback expressed through Share an Idea and other recent engagement processes. The first phase, that is currently underway, is to ensure there is a strong evidence base for wider engagement and decision-making in subsequent phases of the project. As part of this ‘Capacity Assessment’ a review of future projections for household and business growth and tracking market indicators is underway. The commercial feasibility of land currently zoned or planned for future housing or business activities but not yet developed, is also being tested to determine how far each council’s infrastructure planning will accommodate these areas. 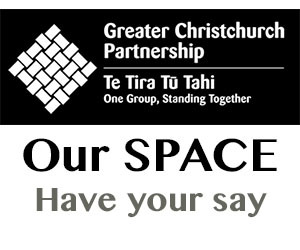 To get in touch by email, and to send any relevant information from your organisation, please contact: ourspace@greaterchristchurch.org.nz.